Nespresso sent an email to their club members this morning about a Nespresso machine promotion that starts Thanksgiving day and runs through the end of November. The details of the promotion is that you must buy a new (not refurbished) machine and depending on the retail price, you can get either 30% or 40% off! To qualify for 40% off, the Nespresso machine you’re buying must be priced at $300.00 and above — this includes all Kitchenaid and Lattissima models. If the machine is below the $300 threshold, then you get 30%. Most models under the Evoluo, Vertuoline, Pixie, Innisia and Citiz are $299 and under. On top of the 30-40% off, they’re also offering free shipping if you order online. 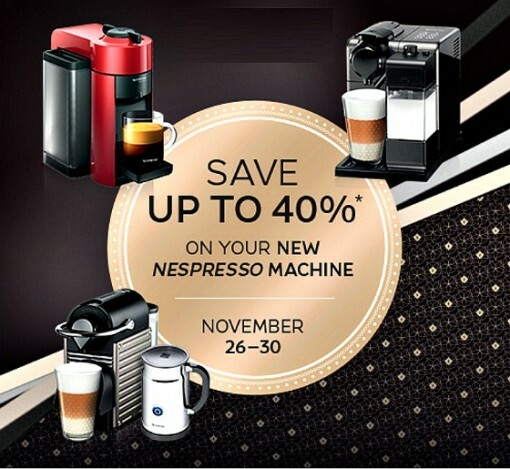 I’ve never seen Nespresso run a 40% off promotion (along with free shipping!) and this is a much better deal over last year’s 25% during Black Friday, so if you’ve been thinking about a Nespresso machine, this is a good time to jump in on one of their espresso or coffee machines.